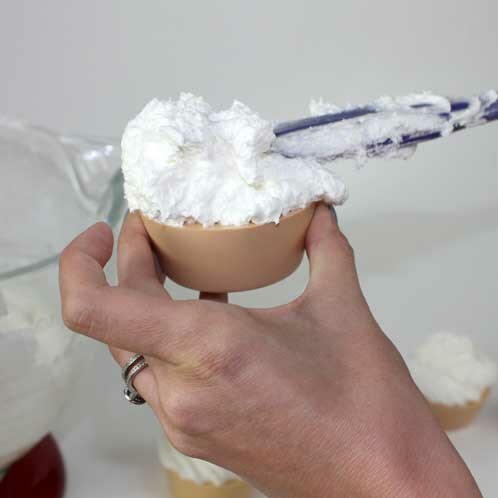 ONE: Add the foaming bath whip, Meringue Powder, Liquid Glycerin and Clementine Cupcake Fragrance Oil to your mixing bowl. 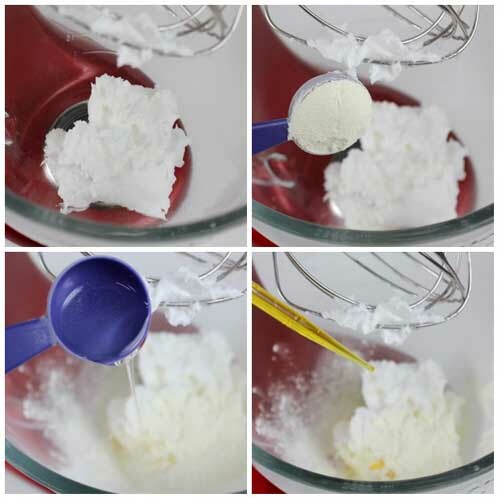 Hand stir with a spatula before turning on the mixer (or you’ll have meringue powder everywhere). Then turn the mixer on medium and mix for about 1 minute. 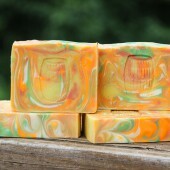 Note: Clementine Cupcake Fragrance Oil will naturally discolor the frosting to a light orange hue after 1-2 days. TWO: While the mixer is still mixing. 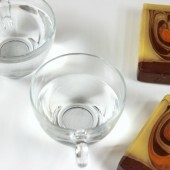 Melt one cup of clear melt and pour soap base in the microwave. 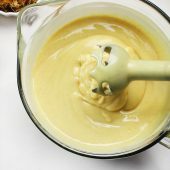 Once it has cooled down to 150 or 160 degrees, slowly add it to the mixing bowl. Mix for another 1-2 minutes on high. THREE: Test the consistency of the mixture to make sure that it’s stiff enough to form peaks in the bowl. 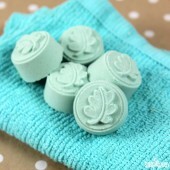 FOUR: Have soap already made and ready to frost. You’ll have about 5 minutes to work with the frosting before it starts to harden up into a gunky mess making it very hard to pipe. 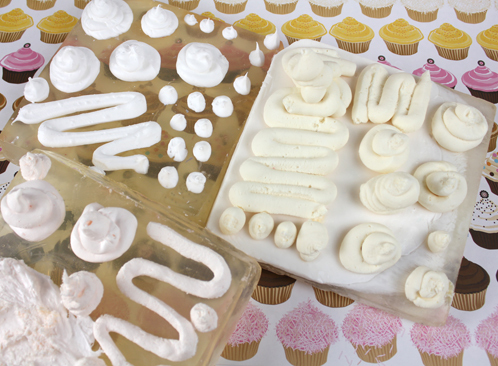 Do you like the soap cupcakes we made? 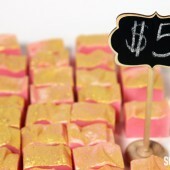 We used Shaving Melt and Pour with a combination of Bakery Beige and Butter Cream Yellow from the Sweet Treats Colorant set and scented them with Vanilla Select. The mold on the left is the Silicone Cupcake Mold. The mold on the right is the Scalloped Round. FIVE: Put the frosting in your piping bag and pipe away! 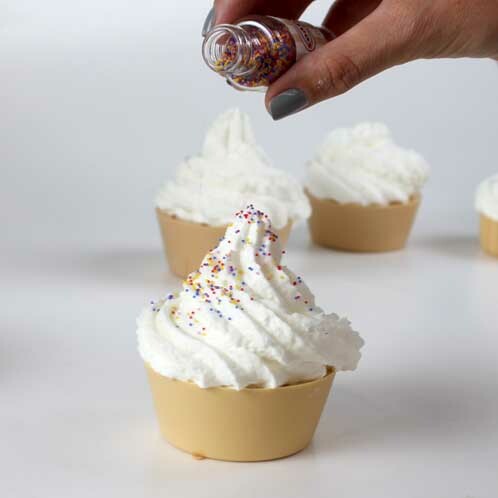 Alternative: OR frost the cupcake like I normally do at home with real cupcakes…by glopping it on. It looks surprisingly cute! 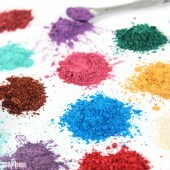 SIX: Add your soapylove sprinkles (or any color of jojoba beads) and let the frosting harden up for 2-3 days. The longer you let it sit out, the harder it will get. Note: Once the frosting hardens up it will still have a spongy texture. It will never get rock solid. However, it’s hard enough to package and ship if it’s packaged properly. If you’re looking for a frosting to turn rock solid, you’ll need a different recipe. 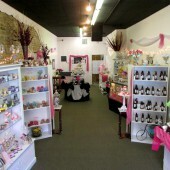 Try some of our other tutorials: Cold Process Cupcakes or Cupcake Bath Bombs. This is what the frosting looked like in our testing phases. It took us a couple of tries to get the perfect combination. Recipe #1 on the left. Recipe #2 top, middle. Recipe #3 on the right. Why yes, those are large slabs of soap. Directions: Whip the ingredients together in the mixer until it’s light, fluffy and forms peaks. Frost your soapy cupcakes just like in recipe #1. Notes: This frosting does not harden. It’s the softest recipe of the three. This is also the easiest recipe with the longest working time, so it’s great for beginners. Notes: This is the thickest of the three recipes and a little more difficult to pipe. The trade off is that it’s the hardest of the three recipes after letting it dry for 2-3 days. Been dying to try this out and I finally have all the ingredients I need! However I have a question about the amount of fragrance. If the recipe calls for 6ml of fragrance, and the one I choose contains vanillin I know I have to use an equal part of the vanilla stabilizer. But if I include 6ml of the stabilizer won’t it change the consistency of the frosting by making it more liquid? 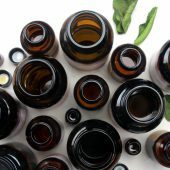 Should I reduce my fragrance to 3ml with 3ml of stabilizer to equal the total of 6ml – making the fragrance weaker? We actually used the Clementine Cupcake Fragrance Oil for this particular frosting and didn’t use the Vanilla Color Stabilizer, so it did change colors after a few days. 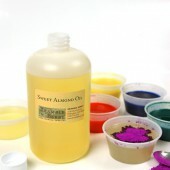 But, you can still add 6 ml of fragrance oil to 6 ml of Vanilla Color Stabilizer. I would do a small test batch, and if you find the frosting to be too runny, you can always add a bit more meringue powder to help it harden back up! Hi Becky, thanks for the info! I did a small batch, and used clementine cupcake for the base and I didn’t use stabilizer either. What color did your change to? I colored the base with Bakery Beige from Soapylove. For the frosting I used vanilla select but I cut it in half and the other half I used the stabilizer. It still smelled amazing. I was worried that it wasn’t going to harden (I used recipe #3) because after a couple of hours it was still moist, however I just read above to give it 2-3 days. Hoping that will do the trick! If not, planning on adding some cream of tartar to see if it makes a difference. 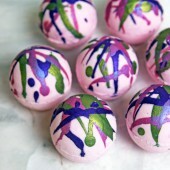 I’d like to use recipe #3 with bath bomb cupcakes to make them bubbly since I’d rather avoid the SLS right now. Has anyone had any luck with that? The Clementine Cupcake Fragrance Oil will naturally discolor the frosting to a light orange hue after 1-2 days. Definitely keep us up-to-date on how your melt and pour cupcakes turn out! 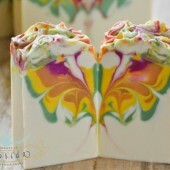 We did try the third recipe and it was just as bubbly and lovely in the bath and shower. I hope this helps! If you get any pictures be sure to share them with us on Bramble Berry’s Facebook page. Hi Becky, I thought I’d follow up with my progress. After trying recipe #3 it didn’t harden. It was a good consistency for piping, just wouldn’t get harder than how it was when I first frosted it. So I scooped it off, and added twice the amount of meringue. Re-piped, and although it was stiffer after a couple of days, it still stayed creamy. After doing a bit of research, I decided to experiment. I melted down white M&P (twice the amount as the foaming bath whip I used), scooped off the frosting I already made and added it to the melted m&p. I also added about a tablespoon of warm water and beat it on high until it became like marshmallow fluff. I was able to pipe it (not perfectly but close) and after an hour or so it hardened up. I still need to perfect my ingredients and amounts but I think that’s the way to go if you want a hard frosting. The combination of the Foaming Bath Whip, Glycerin, Meringue, warm water and Melt & Pour made a good consistency to pipe and then harden. what would be the best way to package these for shipping? For my shows, I just package in a cello bag but I have been leery of shipping them. If you are having a bit of trouble getting the frosting to adhere to the base, make sure you are spraying the M&P base with a bit of rubbing alcohol (70%) before adding the frosting. If it still isn’t sticking, go ahead and use a bit of M&P base as “glue” to make them adhere together. I hope this helps! This frosting should stick to the base if you spray a little 70% rubbing alcohol on the surface of the cupcake. 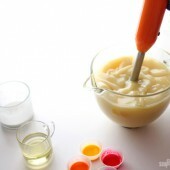 You can also heat a little melt & pour and use it like glue to get the frosting to adhere to the cake! I love this recepie though when I use a lemon scent it turns the frosting a horrible yellow. any ideas why this happens? 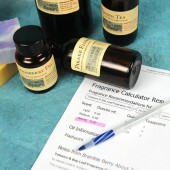 Some lemon scents do have a vanilla content in them which will discolor your products. Which fragrance are you using? I can’t wait to make this recipe! For the first recipe, can I add color? If so, what kind do you suggest? 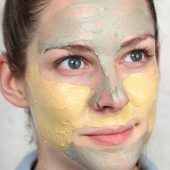 It might not be mold but it could be the fragrance you were using. 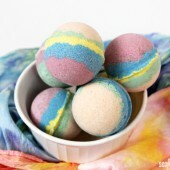 Some fragrances that discolor do tend to look like mold at times in the bath bomb cupcakes. Which fragrance did you use? 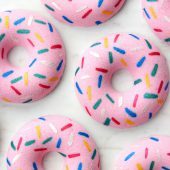 Would it be possible to add sugar or salt to the frosting? I’m thinking it might be a little “perk” to the frosting only being able to be used once. 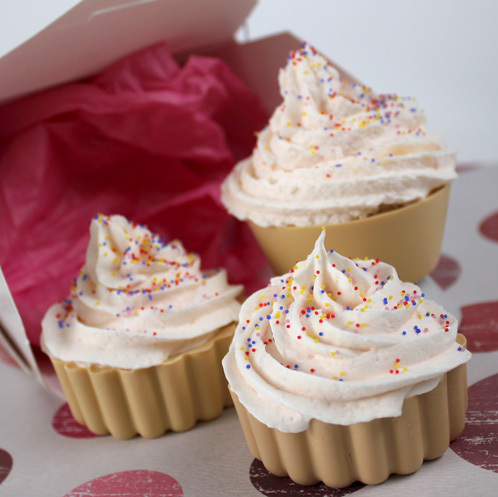 A little exfoliating soap for the first bath, then use the rest of the cupcake for future baths. We’ve never tried that before, but you could definitely try it out and let us know how it works for you. 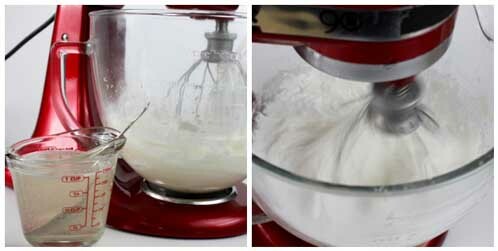 In the foaming bath whip frosting, it is the meringue that usually causes that frosted peaks. 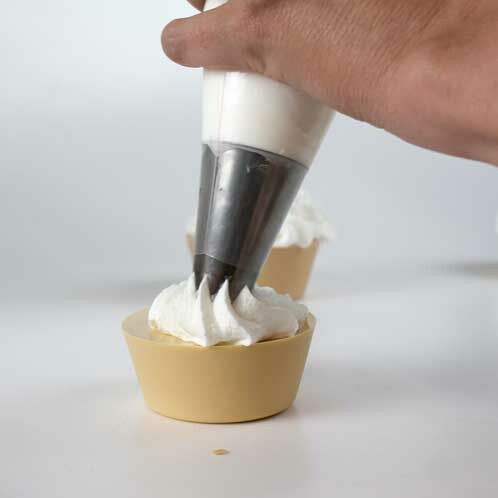 Would this bath whip frosting be able to be spooned into a silicone soap frosting mold ( I had swirl frosting for soap cupcakes specialty made…..) and be able to pop out and then attached to a soap cupcake base or would this frosting not get hard enough if it’s in a mold? I love this recepie and it is flying off my market stall. 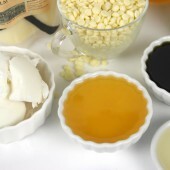 I make cupcake bases with shea butter in a variety of colours then frost with this recepie. I think it is like piping fresh cream. it takes about 4 days to harden fully I have found. 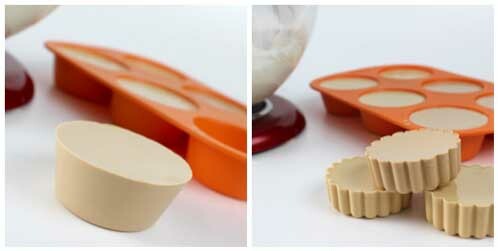 I package them in in plastic dome shaped cupcake tubs (just make sure your base mould is small enough to fit). A selling point is that it melts like ice-cream. if you haven’t tried this DO. I see no need to change any of the ingredients. Well done Ann-Marie and team. Hi there! 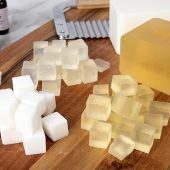 I was thinking about trying this recipe but I’m a kind of a beginner at soap making… I’m concerned that the mix will harden before i get to frost all my cupcakes. Could this be re-melted and then re-whipped? 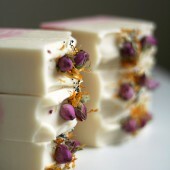 If so would i need to add anything like water or liquid soap before re-melting and apprx. how many times could i re-melt/ re-whip before it ruined the mix? 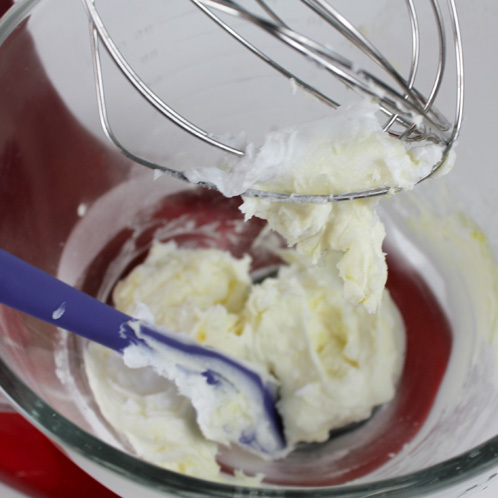 With this sort of whipped frosting, it does harden up quickly, but you do have about 5 minutes to work with it. 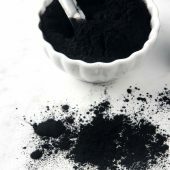 If you are worried about it hardening up too fast, I’d suggest making a small test batch and play with it until you feel comfortable enough to make a bigger batch. could this be used on top of a bath bomb or would it fall off?? 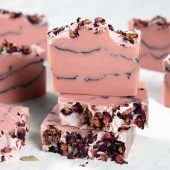 This recipe would be fabulous for bath bombs and it would stick really well! 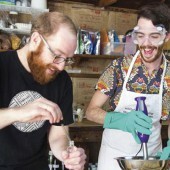 Wondering could this foaming bath whip be used to create a shaving cream type soap which will not get hard but will remain soft and fluffy in a jar? 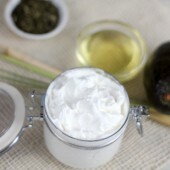 I don’t know of a french website that sells the foaming bath butters, I am sorry about that! 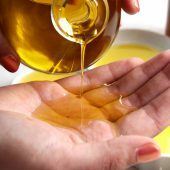 Does any of these recipes become solid after drying? 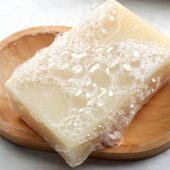 I have been using 4 parts M&P to 1 part Liquid soap and it pipes wonderfully, but does stay very marshmallowy. 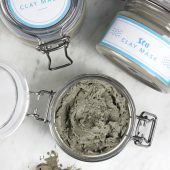 Would adding a small amount of meringue powder help it become harder? Meringue powder is what we used in recipe 1 and 3 to harden it up a little bit. Give it a shot. Just know that it won’t completely harden up. I think melt and pour frosting will be a never ending chase for perfection. We’re always trying new recipes. Let us know if you some up with something new! It is a #1M open star tip. Thanks! I’ve just finished frosting my first lot of orange cupcake bath bombs with this recipe. Looks amazing. I’m so very pleased with them. Although I think I may try a 2:1 ratio next time and only 1 tablespoon meringue powder. Much nicer than the recipe I previously used. 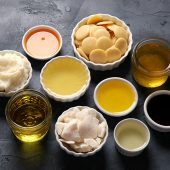 If you’re just playing around with the soap and the oils then there’s no need for a preservative. You’ll only need a preservative if you add water to the project. There is water in the Foaming Bath Whip but it already contains a preservative. The frosting also tend to sweat like soaps? The frosting does not sweat like MP soap. It gets pretty dry. 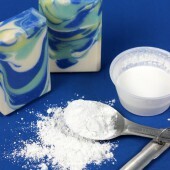 I was wondering if I could harden up this frosting by adding some stearic acid to the M&P soap. I’ve never used it before but I understand it can be used to harden M&P soap. Anyone ever given this a go? What would be the suggested usage for the recipe above, and do you think it would work? All my customers are international so I need the frosting to be robust enough to be knocked about a bit in transit. Haven’t tried it but if you do it, I’d start at a 5% and keep in mind that the Stearic Acid will go pretty hard pretty quickly if you add it to cooled product so you’ll want your entire mixture to be warm enough that the wax doesn’t instantly harden up on contact. 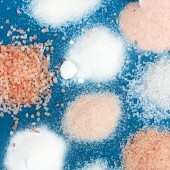 What do you mean by meringue powder? Cream of tartar? 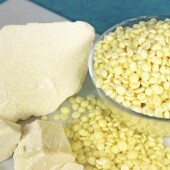 They are both ingredients used in cooking that we can also use in our soap frosting. They harden and stabilize in the recipe. I like this idea! I don’t really like the the way the other icing recipes . They are kind of disappointing to dissolve. Kids will love it in the tub. 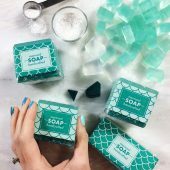 Then can smash it between their fingers and use it as a sudsy soap! Gotta love foaming bath whip! 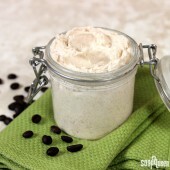 Shea Butter sounds like a great addition to the recipe. Love it! There are 8 ounces in one cup. So (roughly speaking) there will be about 2 cups of foaming bath butter per 16 ounces. 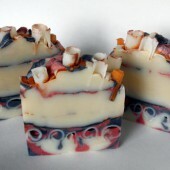 Same with the soap base. Their densities are a little different so that’s not an exact conversion (but close). Yes, these will be a one time use soap as far as the frosting is concerned. The soap can be used way more than that though. 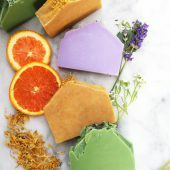 Are these soaps one time use only soap or can they be used multiple times? How long does this take to harden? I’ve tried 2 batches, and they’re both still the same consistency as when I piped them? Maybe I should whip them longer? I’m using a handheld mixer, so perhaps I’m not whipping them enough? Thanks! 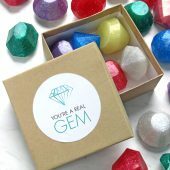 Love your site!! Our hardened pretty nicely over a few days (4 maybe?) and then over the weekend, they got pretty hard. They’re not like rock hard but they are definitely hard enough to ship and still hold their shape. It might have to do with being in a more humid climate or not too? Give it a try. 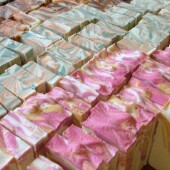 We’ve heard from a couple customers that they use more melt and pour for a harder consistency. This looks great! 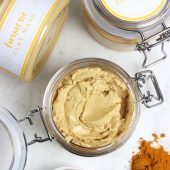 I’m wondering if there might be a vegan alternative to the meringue powder? 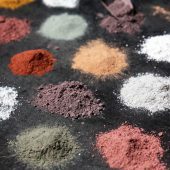 Not that I know of; sorry =( But you could use one of the recipes at the bottom of the blog post that didn’t use the meringue powder and just deal with the trade off in hardness and pipe-ability. 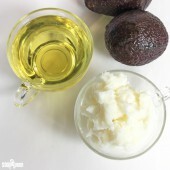 Is this foaming bath whip the same as the foaming bath butter you guys used to carry? Or is it a different product all together? How many ‘cupcakes’ should this recipe frost? 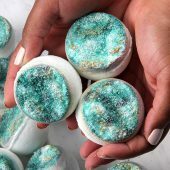 This looks absolutely lovely and I can’t wait to try it on bath bomb cupcakes! Thanks for sharing it with us! We frosted 9 cupcakes with frosting left over. I would say it could frost 12 or 13 soap cupcakes. Does the bath whip stick to the hardened soap well? Do we need to spritz with alcohol first (as if we were pouring layers?) 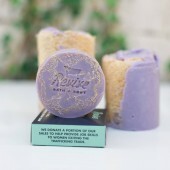 and lastly, is the bath whip topping a one use thing? Thanks! These are too cute! I make cupcakes from a cupcake tray mold with a cupcake frosting mold and then stick the two together. This seems like it would be easier! No need to spray rubbing alcohol. They stick to the soap great. Yes, these will be a one time use soap as far as the frosting is concerned. I hope you give it a try. 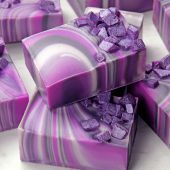 It’s a fun and unique way to make cupcake soaps! 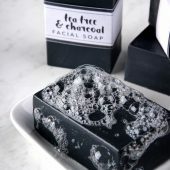 Is this product used as soap in the bath or shower? Forgive me, but I am having trouble visualizing its purpose, other than it looks like something you could eat. Yes. 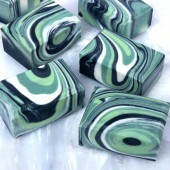 Foaming Bath Whip is a cream type soap that you can use in the shower. 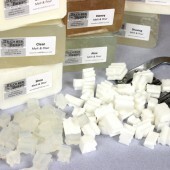 When you whip it up it’s also a great shaving soap. Great!!! Question…? 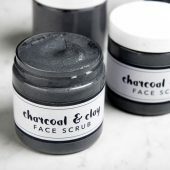 Can this also be used on bath bombs,and cupcake bath bombs? Thanks!!! Totally! 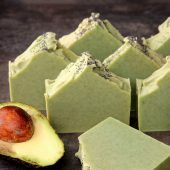 This recipe would be great for bath bombs. 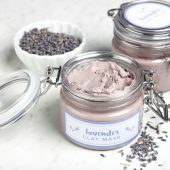 Just curious, in experimenting, did you try a 2:1 MP to Bath Whip (twice as much MP as bath whip) with just 5% glycerin) – no meringue powder? This dries up nice and hard. 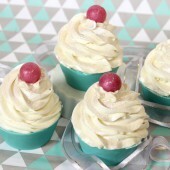 We didn’t try that ratio because it seemed super similar to this recipe http://www.soapqueen.com/bath-and-body-tutorials/melt-and-pour-soap/soap-queen-tv-whipped-soap-cupcakes-2/. We’ll have to give your recipe a try. Thanks for sharing! It’s really got a lot more body than the recipe with the liquid soap. Plus it’s harder than anything I’ve tried with meringue powder. 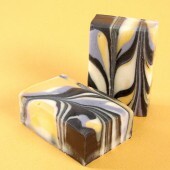 oops, entered too quickly… “harder” meaning it dries harder and produces a soap you can use more than once. I’m just having a hard time understanding everyone’s need to use meringue powder. I know it would make the whipped soap whip up lighter, but that shouldn’t be necessary. 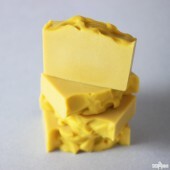 Plus I think it makes the whole structure softer and less able to use more than once. 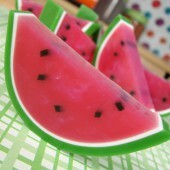 These are so scrumptious looking! 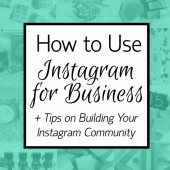 I would love to pipe that foaming bath whip – I’ll have to give it a try! 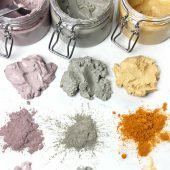 I’ve worked with meringue powder for years in cupcake “frosting”…and no, it doesn’t go bad or affect your soap or your body in any way. The longer you let it sit out the harder it gets. 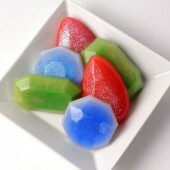 It will always have a spongy texture but they are definitely hard enough to package. I’m in love with this project. 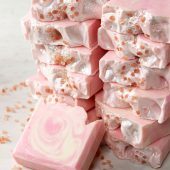 Will the meringue powder go bad or get stale and effect the soap? The meringue powder won’t go bad. It’s designed to get hard which is why it works for the recipe. Hello, I followed this recipe, my cupcakes look so pretty but the frosting did not get hard enough… do you know why? The frosting in this recipe does harden up, but it will still have a bit of a spongy texture and doesn’t get rock solid. Is that how yours looks like?